Daniel and Xander take a crack at brushing a sheep. 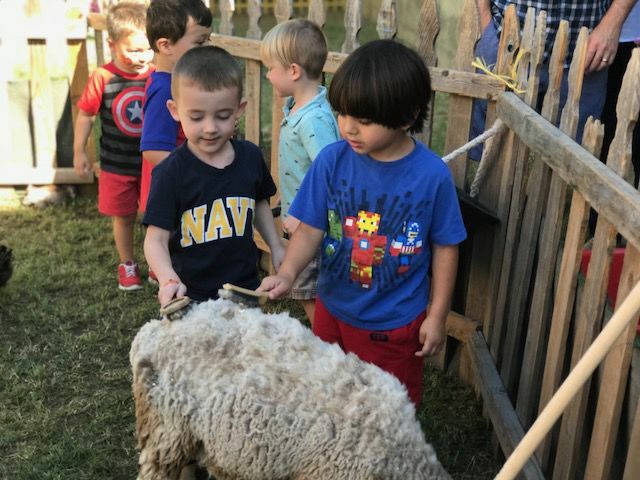 The petting zoo was one of several activities at Beth El Congregation’s Early Childhood Center and Preschool Fall Festival. This group represents a small sample of the hundreds of women who attended and kneaded challah dough at the Shabbat Project’s Shabbos Shuk and Great AZ Challah Bake at the Valley of the Sun JCC on Oct. 26. Rabbi Daniel Landes presents his lecture, “The Poetry of Rav Kook: Finding the Lights in a New Dark Age,” for Valley Beit Midrash at Congregation Beth Tefillah on Oct. 25. Landes is the former director of the Pardes Institute of Jewish Studies in Jerusalem and New York City. To listen to a recording of the lecture, visit valleybeitmidrash.org. Valley of the Sun JCC clinical nutritionist Christi Christiaens, center, shares tips during the Nutritional Shopping Tour at Whole Foods in Paradise Valley. Participants learned the advantages of eating whole, organic foods, how to pick the best foods in each department, and the nutritional value of each in optimizing health.